Solar panels are very expensive, and commercial and home solar panels are installed for many reasons. First of course is to reduce the cost of electricity to a home or business while "locking in" power rates for the next 25 years. In addition to these important financial considerations, many people are also trying to do the right thing for the planet by helping to reduce our dependence on fossil fuels that generate greenhouse gases that contribute to global warming. 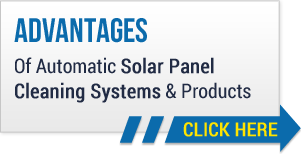 Most solar panel systems are warranted for 25 years, or approximately 9,125 days. If you don't think solar panel cleaning is important, consider that each day during this life cycle some amount of power is lost due to dirt, debris, bird droppings, or plant materials. Not only does this represent a financial loss for the owner, it represents a huge loss to the National Power Grid and shines a spotlight on the importance of maintaining clean solar panels. No one can accurately tell you how much power you will lose due to dirty solar panels. Estimates range from 5% to 30% depending on geographical location, weather, panel mounting angles, smog, bird droppings, and airborne particles. Given the efforts of federal, state, and local governments to create alternative sources of energy coupled with losses averaging 10% to 20% for every solar panel system in the country, we are seeing a huge waste of clean energy resources. Consider that most users clean their panels approximately every three months. With professional cleaners typically charging $5 to $10 per panel, a typical system of 40 panels would cost $200 per cleaning. At a rate of every three months, this would amount to a yearly cost of $800 and a lifetime cost over 25 years of $20,000. Now consider that if you clean your panels every three months they are at their maximum production level for only four days each year. Each day of that three month span following cleaning day would see a loss of power due to accumulated dirt and debris. Over the course of 25 years (9,125 days) you would have just 100 cleanings, meaning that over the remaining 9,005 days your system, as well as the National Power Grid, would be losing a fraction of its potential on a daily basis. If ever there was an argument for the need for the type of attachable electric solar panel cleaning systems available today these numbers bear it out. Electric solar panel cleaning systems maintain cleanliness on a consistent basis, meaning your system will operate at maximum capacity every day of its lifespan. And in turn your energy bills and the environment will both reap the benefits.